essences to raise skin immunity and promote circulation. Enhanced with the active benefits of Australian native extracts and aromatherapy pure essential oils. 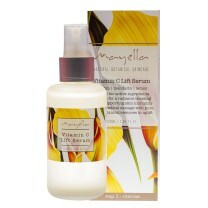 Mayella ® Vitamin B Vital Lotion has been formulated containing certified organic and bio-active botanicals. A vegan, plantbased daily vitamin lotion that is suitable for all skin types, women, men and teens. Mayella ® Vitamin B Vital Lotion is our concentrated vitamin B3 lotion perfect for boosting skin vitality by increasing cellular hydration, microcirculation and raising immunity improving the tone of dull, tired skin. Vitamin B3 (Niacinamide), lactic acid, antioxidant rich vitamin E, and Olivane™ work together to repair, regulate and hydrate suppressed skin. Essentially with the same perfection as the Mayella ® Vitamin B Active Lotion, but the difference being the fusion of powerful aromatherapy pure essential oils. Pure cinnamon, ginger and sweet orange combine to warm and circulate the skin, promoting healthy immune function of the tissues which is something tired or overwhelmed skin finds difficult to maintain. One of the leading active ingredients, Niacinamide – B3, has shown itself with research to be effective in encouraging the production of natural emollients that the skin needs to remain hydrated. The presence of Niacinamide- B3, when applied topically very effectively creates a slowing down the loss of essential enzymes needed for production of cellular energy and lipids. Hydrating at a cellular level Mayella® Vitamin B Active Lotion extends moisture through to building an increase in tissue hydration via its influence on healthy lipid formation. Research has shown the effectiveness of Niacinamide – B3, in reducing water loss and retaining important fatty acid levels which means younger, plumper, firmer skin. Mayella ® Vitamin B Vital Lotion stimulates the microcirculation in the skin, encouraging nourishment and nutrition to the epidermis cells. Niacinamide – B3 is an excellent pigmentation and lightening vitamin that works by disrupting the transfer of melanosome from the melanocyte to the keratinocyte. This disruption interferes with the uptake of the pigment melanin, to the skin, as a cycle that can be caused by UV exposure, hormone imbalances or biological changes such as pregnancy or puberty, and illness. 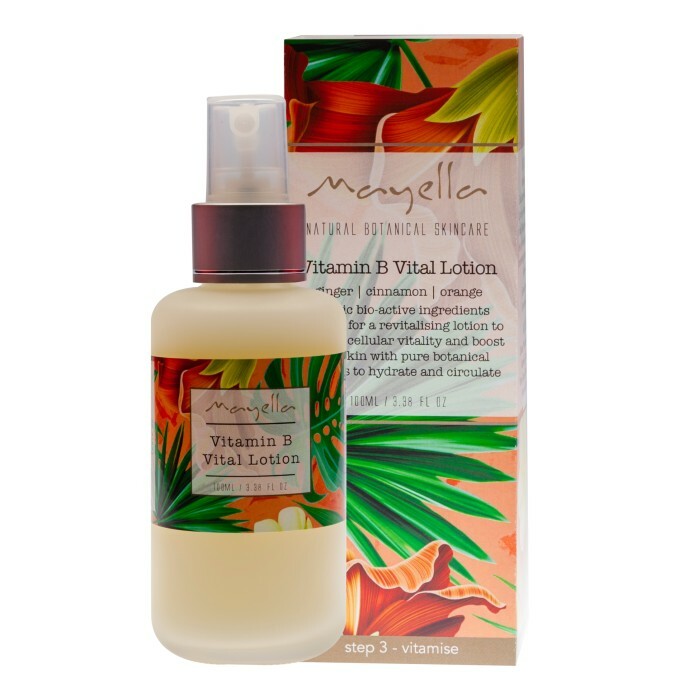 Mayella ® Vitamin B Vital Lotion is the perfect lotion to support healing of marks left by regular breakout or acne. For men post shaving, it will calm inflammation and rashes with an instant soothing action when applied, absorbing quickly to integrate with inflammation pathways in the skin and build resilience. As a lightweight, effectively hydrating lotion, Mayella ® Vitamin B Vital is perfection as a daily mens after shave and moisturiser. Shake bottle well and disperse 1–2 pumps of Vitamin B Vital Lotion onto clean dry hands. Press lotion onto your whole face and neck, massaging in gently with an upward outward circular motion and concentrating on main areas of concern, in particular acne, blemish, and/or dull tired appearing zones. Face and neck will be left hydrated and feeling well circulated, vitalised and ready for Step 4 – Nourish. Contains certified organic bioactive botanicals and aromatherapy pure essential oils of the highest quality sourced ethically and formulated with love in Australia. Plantbased, vegan formulations free of GMO, palm oil, and are animal cruelty free.